BACKGROUND // I had been scheming on this idea for awhile: “What if you made a fully featured tuxedo using the remnants of a sweat pants, sweat shirts and TShirts”? It would have all the comforts of your Lazy Winter Sunday Netflix Binge with the sophistication of Your Boss’s Blacktie Award Ceremony. All in one outfit! When I found out that one of my close college friends was getting married, his rehearsal dinner became to perfect opportunity to showcase this masterpiece. OBJECTIVE // Sew a complete tuxedo by dissecting some sweatpants, sweatshirts and TShirts as my base materials. PROTOTYPE // I believe this was my real foray into using a sewing machine. The original idea was an extrapolation of the Tuxedo shirt; essentially a printed on tuxedo pattern for a TShirt. My first prototype in college was a more elaborate attempt at a drawn on version. It had a couple different articles of clothing but was ultimately only 2D in it’s details, and frankly, underwhelming. This is when my sights were set on a more ambitious version of sweatsedo. When the wedding opportunity rolled around, I decided it was time to learn how to use a sewing machine and put this idea into action. 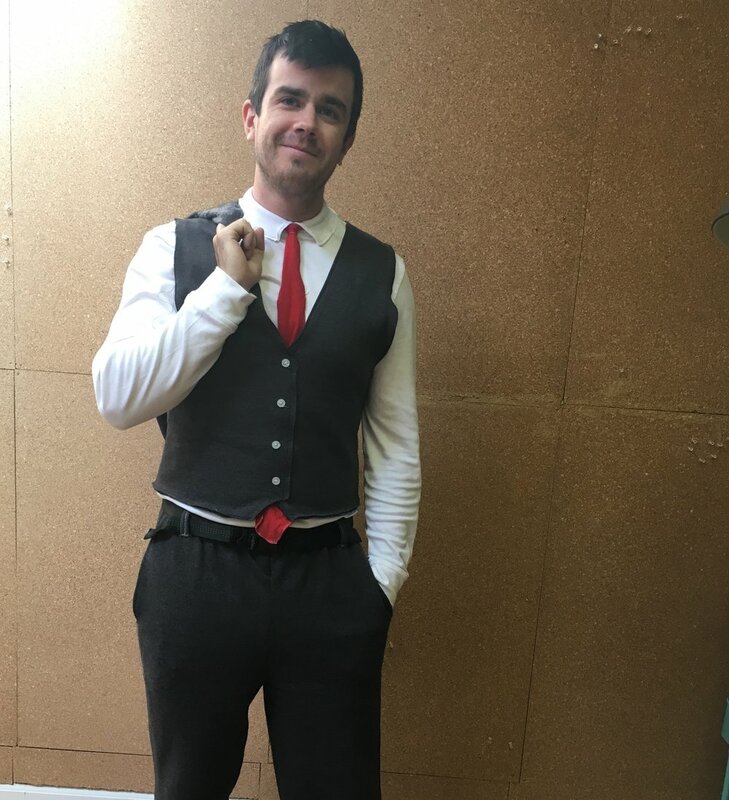 With no real experience in this realm, besides wearing the occasional suit for some event, I constructed a three piece suit consisting of custom sewn shirt, tie, vest, jacket and pants. There is certainly still an opportunity for a revised iteration, but as far as I am concerned, it was the perfect level of comfort and classy that I was going for with the idea.